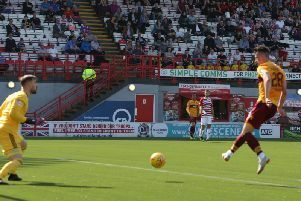 Motherwell assistant gaffer James McFadden has blasted back at the Celtic management team for ignoring Motherwell’s requests for them to warm up on a different part of the Fir Park pitch last Saturday. McFadden was angered when the Celtic party – led by assistant manager Chris Davies – refused to shoot into the portable goals despite ’Well saying they wanted to protect the main part of their immaculate Fir Park pitch. McFadden said: “Celtic were warming up in the wrong area, there’s a portable goal provided which by the rules they have to use – we use them at every stadium we go to and every team that comes here uses it, and Celtic refused to use it. The former Scotland international star continued: “A lot has been said about how the manager reacted but we’ve been to Parkhead, lost 5-0 and took it on the chin, we’ve went up we’ve shook hands and we’ve said well done you were the better team. “Chris Davies decides not to shake hands, to put his face in other people’s faces, which is a lack of respect regardless of whether you’re the assistant manager of Celtic or anybody else.